As Emily spent the winter making The Caversham House her own, she enjoyed choosing colours, shopping for antiques and new pieces and finding fresh homes for treasured memories. Throughout the house, Farrow & Ball colours updated the rooms and added a soft, inviting cosiness. Indian rugs were found to warm the spaces and antique lighting was installed to add a glow. William Morris drapes were brought back from England in suitcases and lace curtains imported from Scotland were ordered. Emily’s mother Catherine is a painter and Emily raided the walls of her house, absconding with some of her favourites. Throw pillows were tossed, silver polished, and bookshelves filled. As it came together, Emily’s friends and family agreed that she had created an unique and special haven for her guests to relax and enjoy. Charles Farquharson was born in Stratford in 1877. He was to become one of Stratford’s leading citizens. 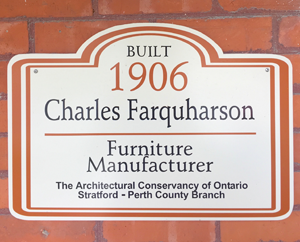 After leaving school, Charles Farquharson worked in Stratford’s bustling, furniture manufacturing business, forming the Farquharson-Gifford Furniture Manufacturing Company on Douro Street. Mr. Farquharson was a leading sports figure on local lacrosse and hockey teams. He was involved in securing a franchise for Stratford in the Canadian Professional Hockey League when it was organized. In 1904, Charles married Edith May Barton and a year later Charles built the Edwardian house at 155 Cobourg Street where the young couple raised their family, Charles, Harold and Dorothy May. 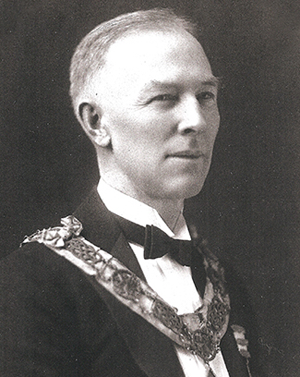 Mr. Farquharson was a prominent member of the Masonic Lodge. He was a Past Master of the Stratford Lodge and held high positions in a number of other Southwestern Ontario lodges. Charles Farquharson died in April, 1931. He was survived by his wife, Edith, his daughter, Dorothy, and his son, Harold, who continued the business his father started. The Farquharson- Gifford Manufacturing Company remained in business into the 1960s. The building that housed the company is one of the last furniture manufacturing buildings still standing in Stratford today.